Komatsu America Industries, Rolling Meadows, IL, showcases its servo presses and will have booth personnel on hand to discuss its installed base of more than 2500 single- and multipoint straightside servo presses. 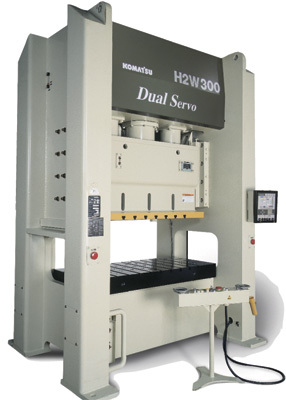 Under power at the booth will be a Model H2W 300, a 330- two-point mechanical servo press featuring independent drives. The firm's servo presses-with capacities from 35 to 2500 tons-feature slide accuracy and repeatability measured in microns, as well as fully programmable slide velocity and dwell for optimum throughput and control of reverse loading. Logopress3 Blank flat-blank prediction and FEA software is included with Logopress3 die-design software and also is available as a standalone package.